Hi Gabriella, why did you become a licensed acupuncturist? I became fascinated with the concept of energy and how emotions affect our overall health and psychology. I researched acupuncture while I was a holistic health coach many years ago and fell in love with the fact that acupuncture is a holistic modality that is concerned with the wholeness of the patient and not just what may be out of balance at the moment. I wanted to offer my patients a more complete medicine and not just focus on nutrition, which is one of the focus branches of TCM. Today, I'm still amazed at how sophisticated and complete Traditional Chinese Medicine is, and I feel honored that I get to grow and share this medicine with others. There is nothing more gratifying than to participate in someone's healing and witness their transformation out of physical or emotional pain. What distinguishes you from other licensed acupuncturists? I come with my own history and experience that contributes to what I share with others. My holistic nutrition background and my personal studies into metaphysical realms give me a unique perspective in how I approach health and balance. I feel my strengths come from being an active listener and being able to combine modern and ancient techniques to deliver the best treatments possible. I stay healthy in my own life primarily by eating quality whole foods, moving my body and getting as much acupuncture as possible. I love to walk in reservoirs around Chicago and taking public transportation when I can. Emotional health is super important to me as well and I find my center by being around positive friends and family and exploring more creativity in my life. Hey Carissa, why did you become a licensed acupuncturist? For as long as I have been alive, I have felt called to do healing work. Chinese medicine taps into healing at the level of mind, body and soul. The practitioners of the ancient world understood this connection deeply and intuitively and have provided us with solid theory and tools that fuel the ability to heal on all levels. The birth of my son initiated a healing of great depth inside me and took me on a radical soul-akin journey inward. I began to understand the principles of Chinese Medicine in a whole new way. It was as if the secrets of the ancients began to reveal their wisdom to me and I was open enough to really hear it. My commitment is to guide each person back to their own vitality and inner wisdom. My bliss work is fertility support, guiding other female warriors through all stages of women's health (including postpartum difficulties), supporting women in rising up and stepping into the power of the feminine. I spent several years in San Francisco supporting hundreds of women on their fertility goals. It is an honor and an awe-inspiring journey to be a part of all the little miracles that have come into being. After baby is born, all the focus goes towards the baby. I have found that the mothers need more of that attention and care as the transition to motherhood begins. We all have a vital force within in us and it is my goal to support others in sustaining that connection even through the hardest of days. Lifestyle medicine is an emerging concept that involves caring for yourself in ways that allow for the full expression of your potential in this world. When we remove the noise of the toxic world we live in, we elevate ourselves and remain connected to the path that brings us the most joy. Self love is expressed through self care. Meditation, nourishing food, detoxification practices are essential parts of my daily practice akin to brushing my teeth or eating breakfast. This daily commitment leads to the opportunity and ability to connect with the truest version of myself. This level of healing is possible and within reach. For the past decade I have been treating patients in San Francisco with an expertise in fertility, postpartum care and mental health issues. My approach is truly holistic. All components of a person’s life can impact their health. This is an understanding that I hold with each person as we, together, unearth the etiology of the imbalance and allow for healing to unfold. I see each person I meet along this path as whole and capable of healing. What do you love most about being part of the Herb + Ōhm team? The team at Herb + Ōhm is truly committed to the well-being of the patient. It is an honor to be a part of a team with such high integrity. Hey Heather, why did you become a massage therapist? I chose massage therapy because it incorporates my skills and values from my 20+ years as a sculptor and teacher. I like to say that I massage clay, and I massage people! My hands are my eyes. I can feel and see, in a sense, with my hands, kneading, molding and shaping to promote healing. It’s also very important to me to work with people and shape their experience, as I did when I was a teacher. I believe that my years of yoga practice helped me to develop the physical skills needed to offer high quality massage therapy to our patients. I enjoy helping people to feel better and understand that their symptoms are a form of communication from their bodies. I often see people suffering from pain, but they don’t understand what is causing it. Not knowing what is causing pain is a scary part of being unwell. During treatments, I educate people about their muscles, posture and movement and provide recommendations on how to improve them. I enjoy helping people get to the cause of their symptoms and solve them. I put together a plan with the patient that includes recommendations related to daily activity, self awareness and self care. I eat a balanced diet of whole and minimally processed foods. I exercise almost every day. This is often in the gym, but I also love to walk in my neighborhood. I find it peaceful and nurturing to be outside among the trees and the river. I also practice yoga and make art. The creative process is very meditative. It focuses my mind on positive things and calms me. I work puzzles to relax, and I regularly get seven to eight hours of sleep. What distinguishes you from other massage therapists? My years of teaching experience help me to educate patients about their treatment and self care. Teaching has taught me to be patient and listen. This helps me to better understand and treat my patients. I am certified in Manual Lymphatic Drainage (MLD). Primarily used for supporting a lymphatic system damaged by cancer surgery, MLD can benefit a wide range of conditions from autoimmune disorders to sinus pressure. MLD is a gentle but effective treatment for reducing swelling, relieving pain, and promoting deep relaxation. I also provide Cupping Therapy, a unique ancient and Chinese medicine technique using cups and suction that can provide a deep tissue release for muscles. I use cupping to help reduce muscle tension, encourage circulation, and promote relaxation. Cupping also has a detoxifying effect on the body. I love working closely with other professionals on the team and contributing my skills to the practice. I love that I can provide a piece of the healing experience for our patients. With the end of Summer approaching, Autumn brings the annual beauty of falling leaves—but also falling temperatures. This is a time of year when we start to add layers to clothing, take a taxi instead of walking, and generally move less throughout the days. When people don’t physically move as much, it causes a lack of proper movement within the body too. Inactivity can lead to stiffness, poor circulation, pain, and sometimes a predisposition to injury or sickness. In Traditional Chinese Medicine, the diagnosis for this lack of movement or flow within the body is called liver qi stagnation. Symptoms related to liver qi stagnation are wide-ranging and bothersome. Emotional symptoms can manifest as depression, irritability and moodiness, or sometimes as less obvious symptoms like excessive sighing, tightness in the chest, or a general feeling of constraint. Physical symptoms can be as diverse as rib-side pain, PMS, or cold hands and feet. One of the ways to relieve this condition is through exercise. Working out is a way for people to stay healthy and create movement and energy in the body. Exercise improves circulation, reduces stress, helps with blood sugar regulation, and contributes to overall cardiovascular health. Muscles and joints with proper blood flow, flexibility, and ease of movement are often healthy and strong. But how much exercise is enough (or too much)? In Chinese medicine, it’s not about how hard or how long you work out. We view exercise in terms of consistency: it’s about moving qi or energy through the body on a regular basis to unblock whatever has become “stagnant” and restore proper flow to the body. Liver qi stagnation can appear either due to a more sedentary lifestyle or from stress that causes tightness in the muscles, stiffness in the joints, and overall inhibition of blood flow in the body. Often, when we work out consistently (4-5 days per week for 30 minutes per day) it will improve energy and help us to feel happier, warmer, more energetic, and more alive. But when people overdo it and push beyond the body’s limits, the effort can backfire and lead to signs of depletion. At Herb + Ōhm, we see this all the time in our practice. When it comes to exercise, more is not better. Balance is better. How can you tell if you’re over-doing it with exercise? The most common sign is extreme fatigue. If you work out and then feel like you need a nap or are unable to make it through your entire day, then it’s a sign that your exercise intensity is not beneficial. Headaches, inability to focus, and light-headedness are all signs of expending too much energy. If you experience these symptoms after exercising, it could be a sign you need to scale back. The goal to eliminate liver qi stagnation is to get things moving in the body so that you feel better—not depleted. In practice, striking this balance becomes especially relevant for women who are trying to conceive. This process requires energy (or qi), and there needs to be a balance between unblocking and not over-extending ourselves, which can lead to a state of depletion. How do you feel after your workouts? Do you have more energy? Do you feel better, or do you feel exhausted and need to nap/sleep early? Answers to these questions will help guide you in determining the optimal intensity of your workouts to obtain the maximum benefits from the exercise you’re doing. Micro-what now? What is Microneedling? Demystifying Microneedling; healthy skin is beautiful. At Herb + Ōhm, we strive to bring ancient wisdom to modern Chicagoans, and part of our approach is to introduce the newest technologies to our patients in order to help them to restore balance in their lives. In Chinese medicine, we diagnose by finding a pattern of symptoms, and one of those patterns is what we call blood deficiency. When blood deficiency takes place in the body, it sometimes manifests with symptoms that present as a lack of moisture: brittle nails, dry skin, pallid complexion. That’s because blood is the body’s primary form of nourishment and moisture. Often, we find a contributing factor to the symptoms of blood deficiency is dehydration. Many factors can contribute to chronic dehydration―medications, caffeine intake, and alcohol consumption (see our recent blog post here —but a big part of it is also water. When was the last time you thought about how much water you drink each day? If you’re like 75 percent of Americans, the answer is not very often. In TCM, the organ systems most often associated with blood deficiency are the heart, liver and spleen. A blood deficiency manifests in each of these channels with slightly different symptoms, but some of them also overlap. Additional symptoms of blood deficiency include dizziness, light headedness, difficulty concentrating, fatigue, heart palpitations, poor memory, anxiety, insomnia or dream-disturbed sleep, lack of menstrual cycle or amenorrhea, numbness/tingling of limbs, muscle cramps, and floaters in the eyes. When there is an organ system that is imbalanced or not functioning at maximum efficiency, the functions of this organ system are not only carried out in that organ but also in its entire respective channel, or meridian, in the body. One way to treat these imbalances is by needling points along those respective meridians of the body. These meridians traverse the body, and each one flows into the next meridian making up a whole system. But acupuncture is not the only way to treat blood deficiency. We also recommend consuming foods that increase blood production, like goji berries and beets (not a coincidence that they’re both red in color). And perhaps the easiest way to treat it is to stay well hydrated by drinking enough water every day. Initially, when we find someone who is dehydrated, we ask them to drink half their weight in water ounces for a week. If problematic symptoms improve, then we know we’re on the right track to restoring balance. But it can be difficult to know if you’re drinking enough water each day. Luckily, there is a technology that can help. Introducing our latest discovery in hydration: the Hidrate Spark smart water bottle. Hidrate Spark first helps you by calculating a personalized daily water goal. 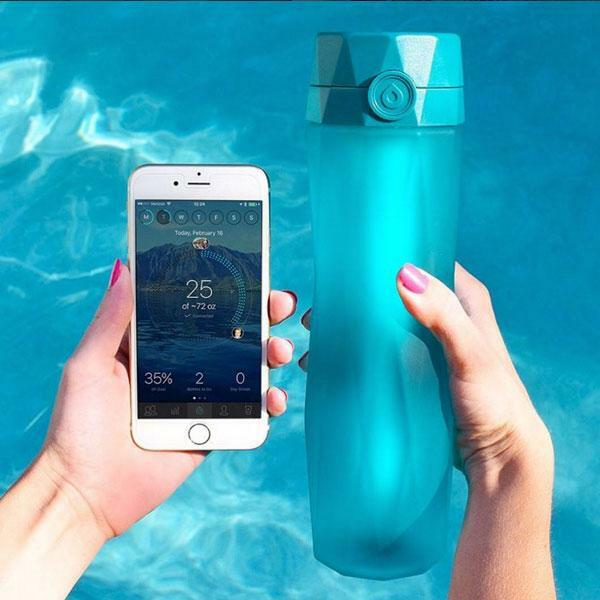 From there, it automatically tracks your water intake and glows periodically throughout the day to remind you to stay hydrated. It also connects via bluetooth to a hydration app and syncs with Fitbit, Apple Watch + more! Our entire team at Herb + Ōhm uses Hidrate Spark, and we love it! If you’re interested in an easier way to stay hydrated every day, you can get 10% off a Hidrate Spark bottle of your own by clicking here. Share it with your friends, and let us know what you think in the comments! Want to learn more about Ancient Wisdom for Modern Living with Herb + Ōhm? At Herb + Ōhm, our mission is to help people practice the art of balanced living by bringing ancient wisdom to modern Chicagoans. Part of the role of this blog is to extend our healing techniques and approaches beyond the treatment room. It’s also a great place for us to share our observations and experiences to help you incorporate more balance in your everyday life. Many times (especially in Summer months) people come to Herb + Ōhm for digestive issues and fatigue or sleep issues. One of the reasons we love Chinese medicine is because the philosophy and approach are focused on understanding and treating the root cause of imbalances in the body instead of the symptoms that appear. Traditional Chinese Medicine "TCM" enables us to create customized, individual treatment plans for each of our patients, and the diagnostic process becomes like a treasure hunt to find the specific imbalance that exists in the body. When we go through the diagnostic process, we often ask questions about lifestyle. In the cases of digestive issues and fatigue, many times we’ll discover the underlying imbalances are caused by certain lifestyle choices, such as drinking too much alcohol. From a Chinese medicine perspective, drinking considerable amounts of alcohol creates excesses in two areas: Heat and Dampness. At its core, alcohol is a diuretic, which causes the elimination of water. In Chinese medicine, when you remove water from the body, you’re left with fire—and that’s why we say alcohol causes excess heat. Alcohol raises the heart rate, increases circulation, and creates feelings of warmth in the body. As a result, it can lead to conditions like sweating, flushed complexion, inflammation, loose stools or scanty/dark urination. Alcohol consumption also causes excess dampness. It manifests due to adding more fluid to the body than is necessary, and that fluid needs to exit the body. Because excess dampness throws off the balance of water in your body, it often creates a swamp-like state in the digestive system. Common symptoms include fullness, bloating, excess gas, and general heaviness in the body and limbs. It also leads to fatigue and most significantly—a thirst without a desire to drink. So, on the one hand, you feel a thirst because of increased heat, but you don’t have a desire to drink because of excess fluid. So, excessive alcohol can result in a double shot of imbalance and unpleasant symptoms. There are acupuncture points and herbal formulas that can help to clear heat and drain dampness to improve these symptoms, but again—Chinese medicine is about treating the root cause. If the ultimate etiology is excessive drinking, then a lifestyle change is needed. At Herb + Ōhm, we strive to develop a partnership in health with our patients, and part of our job is to show people the correlation between lifestyle choices and health outcomes so they can make educated decisions (vs. not knowing what is causing health issues). Ultimately, we want our patients to be empowered to make informed choices about how they want to feel based on what they choose to do. As with anything we enjoy, balance is key. For example, eating a hamburger, a milk shake, a donut or pizza occasionally won’t hurt you. But eating these foods every day can contribute to numerous health issues. Alcohol is the same: consuming 1-2 drinks a couple of times each week is not going to cause overall health issues and imbalance for most people. But drinking heavily each week can contribute to many long-term health issues that can be avoided with balance and mindfulness about what we choose to consume. Have you noticed a correlation between drinking and its effect on your health and wellness? Let us know in the comments! After two short years of starting Herb + Ōhm to help our patients practice the art of balanced living, we’re thrilled to announce the opening of our expansive new office, located on the border of the Loop and West Loop neighborhoods in downtown Chicago. We’ve created this one-of-a-kind space to expand our services, our ability to treat more patients, and to more effectively convey the luxe, calming atmosphere our patients have come to expect from our growing practice. If you’re new to Herb + Ōhm, we’d like to invite you to explore our state-of-the-art facilities and experience the immersive relaxation environment we’ve created just for you. For our returning patients, we’re excited to show you our brand new digs—and take your acupuncture visits to a whole new level of healing and relaxation. Clean. Modern. Luxurious. These are some of the words we’d use to describe Herb + Ōhm's new office. Most importantly, our new space offers not just effective medicinal treatment from the best acupuncture team in the city, but also an unparalleled calming and relaxing experience for the entire mind, body, and spirit. Click and scroll through the pictures below! From the moment you walk through our doors, you’ll notice that everything has been carefully selected to enhance your relaxation and comfort. Our nature-inspired décor brings the best of the elements to you, including oak, marble, cedar, and water—all in stunning neutral tones. One of the most striking visual effects we built in this new space is our unique display of traditional Chinese herbs in spot-lit glass jars, which double as both art and education tools and show our patients how an authentic herbal pharmacy might operate in the East. We also enable you to customize your treatments by choosing from an unlimited catalogue of soothing music on our Sonos system, which is available throughout our space, from the reception area into our seven unique treatment rooms. Customizable aromatherapy to enhance your immersive experience. Click and scroll through the pictures below! When it comes to our treatments, Herb + Ōhm is continuing to provide our patients with the best methods and teachings of Eastern and Western medical philosophies. We will continue to utilize acupuncture and Traditional Chinese Medicine to bring healing and balance to our patients: ancient wisdom adapted to the needs of modern Chicagoans. Please note that we’ve expanded our hours as well to better accommodate the needs of our growing community of patients. We look forward to seeing you at our new location, and we’re excited to continue on the course we’ve set from the beginning: to help our patients practice the art of balanced living. Many patients come to Herb + Ohm for acupuncture to help relieve stress, anxiety and depression. And while acupuncture is very effective at helping them to feel better, we also provide patients with another useful approach to support their treatment and provide long-term relief: positive thinking. So, how does positive thinking work? The mind is a powerful tool with two opposing voices that make up our thoughts and drive our actions (or inaction). One voice is the positive, compassionate, motivating and understanding part of us. It’s the part that says to us during difficult times, “You can do this. You are capable. Just be patient, you are doing a good job. It’s a learning process, and this is only temporary. You’re healthy and strong. You’re trying your best.” This voice treats us the way we would treat a friend or loved one. Then there is the other voice: the negative, judgmental, unsympathic part of us that says during difficult times, “You’re not good enough. You’re not smart enough. You haven’t accomplished enough today. You could’ve done better. You make poor decisions. You could be healthier. You don’t have enough money. You can’t achieve your dreams,” and on and on. This voice makes us feel bad. It often paralyzes us and causes us to stand in own way of happiness and optimal health. It shuts doors of opportunity by creating perceived barriers that prevent us from moving forward in our lives (and perceived barriers are much more powerful than actual barriers). When this voice (or our outlook) becomes imbalanced, and the negative side becomes our more dominant voice or perspective, it often manifests as symptoms of stress, anxiety and depression. If our thoughts manifest into reality, and if the placebo effect really does exist (which there are studies showing it does), then emitting an imbalanced amount of negative thoughts into your atmosphere can be detrimental to achieving the life that that you want to live. It becomes very difficult to realize our goals or heal from sickness with someone hovering over our shoulder telling us, “You can’t do this.” Are you with me so far? So what can you do when your mindset is out of balance? 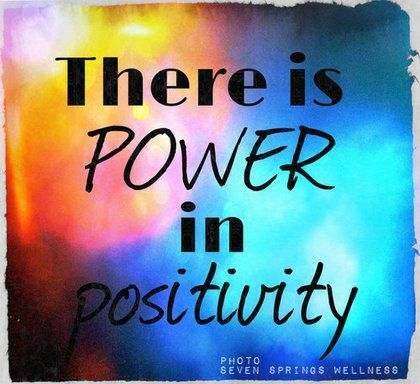 For starters, every time you have a negative thought, you can use your positive voice to cancel it out. Here’s an example: when a friend of mine asked me to run the 10 mile Soldier Field race in May, my negative voice immediately kicked in thinking back to all the times I’ve tried to run in he past and couldn’t run as far or as fast as my peers. My next thoughts progressed downward with, “I can’t do this race. I’m not a good runner. I don’t have the body of a runner. It’s too much work, and I don’t have time. What if I hurt myself? What if I fail?“ But since I have used this tool for a long time, I quickly caught myself and responded with, “You can run this race. You are a fine runner. Your body is healthy and strong. You will get better over time. You can take it step by step and use iPhone apps like 10K runner for support. You do have the time for this. If you hurt yourself, you will recover. You can do anything you want!” Guess how I felt after receiving those messages? I immediately felt better. Motivated. And I moved forward with signing up for the race. After a few short weeks, I have already hit 5k of the 10 miles, and I still have 4 more months of training to reach the rest! How will your life change from this? When you start to implement this activity on a regular basis, you may be surprised at how many negative thoughts you are naturally thinking each day or saying to yourself. It may bring to light just how often you are standing in your own way! But the more you consciously try to change your perspective, the better you will become at shutting down negative thoughts that hinder you from achieving what you want in your life. The ultimate goal of this activity is to tip the balance of the scale in the opposite, positive direction. When you create more positive thoughts than negative, you open doors of opportunity for yourself to create the life that you want. You’ll be spending more time overcoming challenges and less time feeling stressed, anxious and depressed. Once you learn to harness the power of positive thinking, there will be nothing that can stop you from getting where you want to go. If you can understand the power of positive thought, then you can truly hold the universe in your hands. We are so excited to announce that we will be moving to a brand new location in March 2017! Our new office will offer 7 treatment rooms so that we can bring even more balanced living to our patients. While we are still knee-deep in construction, we wanted to share a sneak preview of the space with some demolition photos and the very start of our build-out. Also, check out the writing on the window from across the street of the building's side entrance. It says "The Wolf Is Coming." Dr. Amy Wolf thought that this was pretty neat and a good sign that the office is in the right location! Many of you have been with us from the very beginning, and we couldn’t be more grateful for your support. More updates to come soon, including information about our grand opening. Hi Everyone! We wanted to share some of our top wellness app recommendations to help you live the most healthy, balanced lives possible. Here are some great mobile apps to help you learn to meditate, decrease stress and anxiety, increase relaxation, obtain more restful sleep and get in shape! Headspace is your very own personal trainer, there to help you train your mind. Headspace is meditation made simple. The app includes guided mediations that teach you to meditate when you want, wherever you are, in just 10 minutes a day. Meditation can help improve your focus, exercise mindful awareness, relieve anxiety, reduce stress and most importantly give your mind a rest. This helps increase your mental endurance so you can perform better in all areas of life. We high recommend buying a 1 year subscription and making daily meditation a habit. Brainwave Entrainment is a next generation tool for mental stimulation, spiritual exploration, self-help, and self-improvement. It uses sound wave to technology to help induce various states of mind and to assist in achieving a wide variety of goals, such as alleviating stress + anxiety, sleeping issues, headaches and addiction. Patients love this app because they have the choice to listen to the waves on their own or while they are listening to music, which helps them to blend in and not be noticeable. Can you imagine listening to your favorite song and feeling zen'ed out after it? Or sleepy? Or focused? Whichever brainwave you choose, that is how you should feel afterward! My Fitness Pal is one of the fastest and easiest-to-use calorie counter apps out there. With the largest food database by far (over 5,000,000 foods) and amazingly fast and easy food and exercise entry, this app will help you become more aware of what you're eating and how often your exercising, how it's affecting your weight and health, and how to make changes in your diet and lifestyle to achieve your goals. 10K Runner is a great app to go from couch to 10k. This app has over 1.2 million success stories of people that are now running 10ks and it is what we use here at Herb + Ōhm to train for races. In fact, the maker of 10k runner, FITNESS22 LTD, also has other apps for shorter races like 5k and longer races like a half marathon and marathon. Herb + Ohm founder Amy Wolf is currently using it to train for the Soldier Field 10 Mile Run in May of 2017! 7 Minute Workout: Want to get in shape fast? This app will take you there. It will train you from beginner to becoming fit and is perfect for the busy or traveling professional. This is a great app to add to 5 or 10k Runner to ensure that you are not only working on cardio, but full body strength. It will tone your whole body so you look good when you go out on the town! Herb + Ōhm is rooted in the wisdom of Traditional Chinese Medicine, adapted to the needs of modern Chicagoans. In today's digital world, patients often value the convenience of using apps like those above to assist them achieving superior health and well-being. While the apps above are some of our favorites for 2016, we recommend all different types of apps to patients depending on what were treating. We'd love to hear about some of your favorite health and wellness apps! Please post them below and why you think they're great so we can check them out! Sarah Suzuki, LCSW, CADC and founder of Chicago Compass Counseling interviewed Dr. Amy Wolf, DACM about using acupuncture and Chinese Medicine to treat substance abuse. Sarah and Amy collaborate to help people on their journey toward sobriety and a healthy, happy lifestyle! SARAH: Hello Everyone! 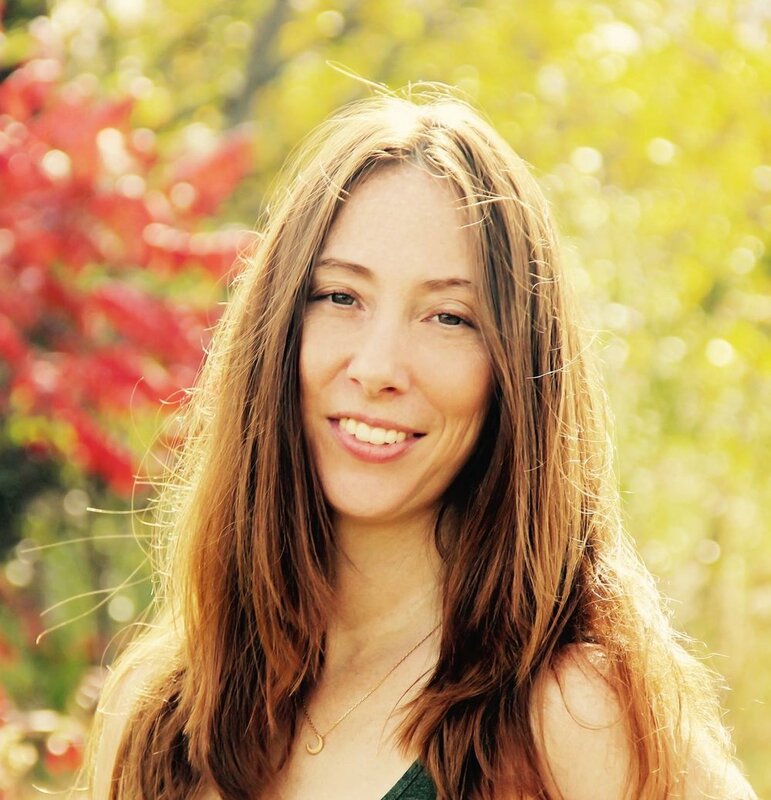 I interviewed Amy Wolf, who practices acupuncture and Traditional Chinese Medicine. Amy Wolf was well into her career as a master’s-level accountant when she made a dramatic change: she left the corporate world, earned her Doctorate of Acupuncture and Chinese Medicine (DACM) from Pacific College of Oriental Medicine, and now runs a thriving medical practice in Chicago’s Loop. She is a licensed acupuncturist and a board-certified Traditional Chinese Medical Herbalist. Amy, thank you so much for interviewing with me! I wanted to learn more about your practice since the patient’s I’ve referred to you have had such a fantastic experience. What do you think sets you apart from other practitioners? AMY: Aside from being one of the few Doctors of Acupuncture and Chinese Medicine in Illinois, one of my biggest differentiators is that I take the mystery out of Chinese Medicine. During each visit, I explain exactly what I’m doing and why, and I try to set specific expectations for what my patients can expect on their path to wellness. I also take insurance and fully appreciate the distinct advantages of Eastern and Western healing philosophies, while maintaining an optimum balance between the two. This synthesis creates maximum benefits and results for my patients. Lastly, I believe that the quality of care a practitioner provides to a patient has healing capabilities. I strive to heal not only through Chinese medicine, but also through the connection I make and the time I spend with patients to show them that I care and am a true partner in their health and well-being. SARAH: It's great that you bring a personal passion and empathy to the field of medicine. That is pretty different from what it must have been like for you in the corporate world. What made you decide to become a practitioner of Traditional Chinese Medicine (TCM)? AMY: I am fueled by my dream to own and operate a business in an area that I am truly and authentically passionate about: Traditional Chinese Medicine (TCM) and integrative healthcare. Before becoming an acupuncturist, I was a tax accountant. A drastic change, right? It was. After spending five years in the corporate business world, I realized that my career was not providing me with the satisfaction that I sought in my personal and professional life. The absence of any semblance of work/life balance prevented me from making my health and well-being a priority, and I was growing old in the prime of my life! This led me on a journey towards changing my life for the better and using my business background to start a practice in an area that I was truly passionate about: TCM. Even when I was in tax, my favorite part of the job was helping, supporting and educating my peers. It was, and has always been about caring for and connecting with people in order to achieve a common goal. Today, this goal is improving one’s quality of life by helping them to feel their best every day. SARAH: Your patients in the corporate world must appreciate you knowing from your own experience how demanding their jobs are, and how hard it is for them to prioritize wellness when they are facing multiple demands. Did you always believe in the efficacy of TCM? A lot of young professionals think TCM is "way out there" or "new-agey." AMY: Before I made the decision to go back to school for acupuncture and Chinese Medicine, I knew I had to believe in my "service/product." I was having some abdominal pain that hadn’t gone away for about two weeks, and I went to see an acupuncturist who was also a Chinese Medical doctor. In one treatment, my pain was gone and I never looked back. This is all I needed to experience to believe in the efficacy of TCM. Don’t knock it until you try it! SARAH: TCM is amazing! I was raised by a doctor who believed that all cures came from a prescription medication. I was skeptical of acupuncture until a short course of acupuncture and herbs cured a bout of insomnia I had in my early 20's. So, let's talk about substance abuse: A lot of my clients are high-powered professionals who binge-drink and use drugs as a way of coping with stress. You know a lot about how challenging stress feels for them. How can TCM help? AMY: 99% of the patients I see come to me for symptoms that arise out of lack of work life balance or from high stress and pressure to perform and succeed. It has become an area of expertise for me and is one of my personal passions since I experienced the pressures of a corporate career first-hand. I love that I’m able to help my patients escape that pressure in a healthy way and give them an opportunity to recharge and relax. Sometimes just having 30 minutes of peace can make a world of difference. Ironically, I sometimes work even longer hours as an entrepreneur, but because I am fulfilling my dreams and pursuing my passion I am able to bring almost unlimited energy to my patients and practice. SARAH: The extra hours really don't feel like work when you love what you do. So in terms of actual research, the people I work with in my counseling practice are drawn to my use of evidence-based practice. When I recommend acupuncture as an evidence-based practice, they are almost always surprised. What is the evidence that acupuncture can help people who are recovering from alcohol and drug abuse? AMY: For centuries, various cultures around the world have placed needles in precise locations on the body to relieve pain and treat disease. Only since 1972, when a Hong Kong neurosurgeon, H.L. Wen, M.D., discovered that acupuncture could alleviate the symptoms of opiate withdrawal, has this method been used for detoxification and relapse prevention. In the United States, acupuncture detoxification was first introduced on an outpatient basis in 1974 at Lincoln Hospital, a city facility in the South Bronx area of New York City. By the mid-1980’s, the success of this unique procedure had become so evident that treatment facilities across the United States began incorporating acupuncture into their substance abuse programming. In 1985, the National Acupuncture Detoxification Association (NADA) was established to promote education and training of clinicians in the NADA ear acupuncture protocol. In 1987, Bullock, Culliton and Olander published the first of many research reports now available on the effectiveness of acupuncture intreating addiction. Acupuncture detoxification has grown rapidly, evolved and is now used effectively for acute and prolonged withdrawal as well as relapse prevention. The protocol has less of a specific effect on addictions or single behavioral health conditions, but is more of a stress reduction and calming technique beneficial as an adjunct to many different conditions. The combined application of acupuncture with counseling, education, medical support and self-help groups enhance opportunities for success. For more research and evidence related to the NADA protocol, please visit this website. SARAH: A lot of my clients are afraid that the needles will cause pain. It makes sense that they would be wary, given that they were abusing drugs and alcohol in order to avoid or reduce feelings of pain. I’ve always found acupuncture to be relaxing – it’s rare that I can feel a needle. Is that a common experience? AMY: Some of the biggest misconceptions of acupuncture are: 1)That acupuncture will hurt (like a shot does at a doctor’s office) and 2) That acupuncture doesn’t work. This is where my love to explain Traditional Chinese medicine comes in handy. Many of these misconceptions occur because this medicine is foreign to people in the US and they have never experienced or been exposed to it. It is important for people to know that the needles we use are so tiny that many time people do not even feel them go in! If you do feel them, it is very subtle like a little pinch or bug bite. In fact, many people like the way they feel similar to how you may like when someone puts pressure on or kneads your shoulders or back when it aches. Feeling something from the experience is a good thing, not a bad thing. It tells us your body is listening. Also, it is important to remember that acupuncture has been around for 3000 years! It was the only medicine that existed in China at one time! Think about that…There are many studies that prove its efficacy. Overall, it helps to strengthen your body and increase its internal resources (pain relieving chemicals, anti-inflammatory chemicals, hormones) so that it can heal itself. It helps our bodies to function closer to 100% of their full potential in order to heal and protect us from disease. SARAH: What is some of the feedback you’ve received from patients who were initially uncertain about acupuncture? AMY: The feedback that I have received from patients who were initially uncertain about acupuncture is that it was more relaxing than they thought. People generally leave feeling calmer and emotionally lighter. People are pleasantly surprised that they have 25-30 minutes to lay down, relax, take a break (or nap!) and clear their minds. There is value in taking time for oneself and relaxing the mind. When the mind relaxes, the body follows. During this time, life slows down, people gain greater perspective, find an opportunity to take a breath, and recharge. This helps to decrease feelings of being overwhelmed, lift one’s spirit, and provide greater direction on how to tackle challenges one day at a time. SARAH: What is the best way for new patients to connect with you? AMY: In today's digital world, patients often value the convenience of booking online. Patients can book via my website, or via the smart phone app Mindbody Connect (by looking up Herb + Ohm). They can also call my business line at 312-757-1882, and I will return all calls as soon as possible. I offer complimentary consultation for those who’d like to discuss how acupuncture and Chinese Medicine can help them prior to receiving treatment. People can also submit their insurance information on my website, and I will get back to them with their coverage in 2-3 business days. Here is a link to my site where people can book an appointment. Here is a link to my website where people can submit their insurance. SARAH: Thank you, Amy! I hope that this will encourage people to try out acupuncture as an effective support in their journey of healing. Want to find out how practices like acupuncture can help you or someone you love manage the stress and pressures of work/life balance? From Rio to Chicago: How Herb + Ōhm Brings the Olympic Experience to You! Two years ago when I opened Herb + Ōhm, if you told me that Michael Phelps would be responsible for a surge in our new patients, I would never have believed you. And yet, a couple of weeks ago during the Summer Games in Rio, when Michael Phelps showed up to his events sporting perfectly circular purple marks across his shoulders and swam for a record number of Gold medal wins—that’s exactly what happened! News outlets couldn’t get enough of Cupping and its many benefits—and modern Chicagoans are no different. Phelps and his fellow Olympians shined a light on what Traditional Chinese Medicine practitioners have known all along: Cupping is a form of Eastern Medicine that has helped patients all over the world to feel better and has been a go-to for acupuncturists for thousands of years! When does the body most benefit from Cupping? We use cupping most often in practice to treat pain. (That helps to explain why so many Olympic athletes were sporting Cupping marks). Whenever there is an obstruction in the body (lack of blood or fluid circulation for example), the result is often pain, stiffness or some kind of pathology (sickness). But why? Blood carries critical nutrients and oxygen to all of our cells to help with survival. Less blood flow means less circulation, less circulation means less function, less function often results in pain. Pain is one of the body's main forms of communication when there is something wrong inside of us. In this way, pain can be a good thing. It functions as the body’s warning system to alert us that action is needed. So what is cupping and how does it work? The concept of Cupping is fairly simple: the treatment involves applying light suction to the body via a cup (shown in the video below). After a period of time (5-15 minutes) the result is generally a pink, red or purplish circular mark at the skin's surface. The visible color you see post-treatment correlates with the degree of obstruction that was found within that particular area of the body. We use the suction of the cups to pull that obstruction or stagnation out of the deep muscle tissue and toward the body's surface. This way, the body can break it down and return to a healthy state of circulation and function. The remaining color is a combination of toxins, lactic acid, lymph, fluids and blood that's been stagnating in the body, inhibiting good circulation to that area. Once it is pulled to the surface, fresh blood takes its place delivering nutrients and oxygen to that area to facilitate healing. Why doesn't everyone who experiences pain in a certain body area have colored marks on their skin after cupping? Good question! We use cupping to mainly treat pain of the muscles. If someone has lower back pain and we try cupping, but not a lot of color comes to the surface, this usually tells us that the pain may be coming from deeper areas of the body such as the bones, joints, nerves or even organ systems. So, in this way, cupping acts as a diagnostic method as well. However, let's keep in mind that our muscles are connected to the rest of the body via connective tissue, so any benefit to the muscles can also benefit other areas of the body such as nerves, joints, bones etc. Applying cupping to any painful area can still yield benefits even if a lot of color does not result from treatment. To give you a better sense of how Cupping works, we included some photos of a typical cupping set we use at Herb + Ōhm, as well as founder Dr. Amy Wolf, DACM, performing cupping on her shoulder after she injured it a couple days prior (shown above). If you’ve been curious about Cupping, since it has been the center of so much recent attention, we offer stand-alone Cupping treatments for pain or injuries. It’s also included as part of our normal acupuncture visits, if you’re interested in a more holistic appointment. Happy Cupping! In addition to using acupuncture and other forms of traditional Chinese medicine, there are other ways athletes seek to up their game as the 2016 Olympics round the corner. One of the simplest ways to increase performance is by watching what you are consuming. You ever heard the saying you are what you eat? Chances are you have, if not, well I am glad that now you have, because there could not be a truer statement. Whether it be adding a powerful-enhancing herb to your day to day routine, or changing some of the foods you eat within your diet, there are vast amounts of ways to up your game naturally. We are barely scratching the surface with this list. Don’t forget, acupuncture is also one of the best ways to increase athletic performance, so come visit us today. Want to know how we can help up YOUR game? Acupuncture has been used time and again to help athletes relieve pain. But acupuncture and the accessory modalities associated with it can do so much more. Using acupuncture treatments can actually enhance an athlete’s performance and recovery from any sports-related injury. Let’s take a look. When an athlete is in training, he or she is constantly pushing themselves to be better: a better time, a longer jump, a further distance, etc. An athlete’s body is put through constant stress. Muscles are pushed to their maximum and sometimes tiny microscopic tears form. If the athlete were able to rest properly, these micro-tears would heal. But, when an athlete is in training, the micro-tears don’t have time to heal properly. So the body becomes fatigued, sometimes painful and the probability of serious injury increases. Acupuncture helps the body to heal, restores healing levels of energy or Qi (pronounced “chee”) and strengthens the body inside and out, thus accelerating the athlete’s recovery time. One of the accessory modalities in the toolbox of most acupuncturists is something called gua sha. Gua sha involves gently scraping the skin with a smooth instrument like a ceramic spoon. The areas scraped are directly over the muscles. Gua sha stimulates blood flow to the muscles allowing them to relax. Gua sha is a great recovery tool for athletes and it was even recently featured in the 2016 NBA Finals. Gua sha is best performed by a trained professional who knows the body well and can determine the best pressure level for your condition. Athletes who receive acupuncture treatments while in training generally recover quicker. They also tend to have more energy and stamina. Acupuncture can be used as a training tool for athletes with great success. But, if you are unable to get regular acupuncture treatments, you can still utilize acupressure on specific points to help boost your Qi and energy levels. One such acupressure point is on the stomach energetic meridian, stomach 36. To locate stomach 36, the leg should be flexed. The point is on the lateral or outside of the leg about three finger breadths from the lower edge of the kneecap, in between the heads of the tibia and fibula (lower leg bones). Applying pressure to this point will increase levels of Qi and blood in the body providing more stamina and fighting fatigue. Another point to utilize is along the large intestine energetic meridian which runs down the arm to the tip of the forefinger. This point is large intestine 4 and it is great for calming spasms and relieving pain. When you squeeze the thumb and forefinger together, the point is at the apex of the mound of flesh that is created. Large intestine 4 is frequently used by acupuncturists to combat pain anywhere in the body. As any athlete knows, stretching prior to a game, match or run is imperative. One of the best ways to stretch is tai chi. Tai chi is an ancient martial art that focuses more on being defensive instead of aggressive. It also utilizes almost every muscle in the body through slow, fluid, animal-like movements. The other nice thing about tai chi is that it helps you focus on your breathing, which helps greatly when training. By practicing tai chi prior to a workout or event, the athlete is getting the best of both worlds, a full body stretch session as well as breathing techniques. Overall, this makes for a more balanced and relaxed athlete. There are many forms of tai chi and tons of videos available, so try l and find one that works best for you and your particular sport. As you can see, traditional Chinese medicine has much to offer for athletes both from the training standpoint as well as helping with recovery from an injury. Always seek out a properly trained, fully licensed acupuncturist so you can get the maximum benefits. When you add acupuncture to your training regimen, you should notice quite a difference in your performance. Everyone is looking for that competitive edge. Have you ever wondered how you can easily increase your athletic performance (legally of course)? Well, look no further. Here are three performancing-enhancing herbs that will kick your body into gear and have you playing to the fullest of your potential. 1. Ginseng - Ginseng is a well-known fix to increase performance. So well-known, that many consider ginseng to be the most-studied herb in the field of performance enhancement. It is said to restore Qi and increase physical power. 2. Gotu Kola - Known more commonly as Indian Pennywort, gotu kola increases energy levels and aids in quick recovery of sports-related injuries. The herb can be consumed in pill form, in a drink or in a salad. 3. Rhodiola - Rhodiola may just be your new favorite go-to herb. Ditch the 5-hour Energy, and pick up some of this miracle herb. From fighting fatigue to increasing overall athletic performance, there is little rhodiola can’t do. You can find rhodiola in both pill and powdered-form. Acupuncture "Sticks It" to Sports Injuries! Almost everybody has participated in sports activities at some point in their life. Along with playing sports comes the possibility of getting injured. Most of the time it’s something simple like a sprained ankle or general overuse of a muscle causing pain. For those weekend warriors and everyday athletes, it just means a couple of days rest. But for a professional athlete, a couple days off during the season can really derail their momentum. Many athletes are turning to acupuncture to help them heal quicker. Here are some ways acupuncture helps in treating sports injuries. When there is injury to an area, there may be swelling that accompanies the injury. Swelling is a normal biological function and generally you should let it take its course. But, excessive swelling that doesn’t dissipate can lead to stagnation of blood in the injured area. Over time, stagnation can make an injury worse. Acupuncture needles actually encourage the body to release the swelling quicker through promoting urination. This gets rid of the excess water and allows the blood to flow more freely. Proper blood flow allows the area to receive the components it needs to heal. Sports injuries also create pain. The pain can be localized or it can radiate to other areas and acupuncture is a great tool for treating pain. In fact, pain relief is probably the most common reason people seek out an acupuncturist to begin with. Pain from injury is again related to a stagnation in the energetic channels that run through the body. Acupuncture needles open up the channels allowing blood and lymph to flow freely by removing the blockage. Once the blockage or stagnation is gone, the pain will soon lessen and disappear. Inflammation is frequently a problem associated with sports injuries. The thought used to be that applying ice to inflamed areas would bring the inflammation down. And for the first 48 to 72 hours, this rule still applies. However, 72 hours after an injury occurs, one should begin applying heat to prevent further stagnation in the affected area. That aside, beginning acupuncture treatments immediately following a sports injury is good medicine. There are specific acupuncture points on the body that function to reduce inflammation. So getting treated right away can actually lead to you being back on the field sooner. Muscle tightness and spasms are also common with sports injuries. This happens when the muscles surrounding the area become overworked and overextended. Acupuncture works very well for stopping muscle spasms and releasing muscle tightness. There is an accessory modality known as gua sha that involves gently scraping a smooth surfaced item like a spoon, along the muscle to “release” the tension accumulated within it. Most acupuncturists will provide gua sha after the acupuncture needles have been pulled. This gives the athlete a much deeper treatment and helps the muscles relax back to their normal position. Utilizing acupuncture when you experience a sports injury is a great way to get yourself healthy. And generally, it works faster than just rest, ice and ibuprofen. The acupuncture needles enhance blood flow to the area of injury. Increased blood flow to an injured area allows for the muscles to relax and pain to dissipate. If you have a sports-related injury, consider acupuncture to help you get better. To learn more, contact us below. Your body will thank you and you’ll be back out there sooner than you might have thought. Many professional sports teams now have licensed acupuncturists on staff to help treat injury and increase overall athletic performance within the players. Here are a few famous athletes who receive acupuncture. 1. Aaron Rodgers, the quarterback for the Green Bay Packers is just one of many professional athletes who use acupuncture for recovery and performance. Ever since Rodgers injured his calf in 2015 he has seen an acupuncturist to not only relieve pain, but also to increase his performance on the football field. 2. NBA superstar and newly-retired Kobe Bryant also uses acupuncture. Bryant has been a long time supporter of traditional Chinese medicine, and has used acupuncture to battle the many injuries he faced toward the end of his career. 3. Kim Clijsters, a former No. 1 ranked tennis player, started using acupuncture after sustaining a hip injury in 2010. After receiving treatment for the injury, the Belgian went on finish with an impressive win-streak the U.S. Open. Acupuncture and fertility go hand in hand! Read more about our approach!